For those on tour with the Green and Gold Army, the decision to come on this trip was a simple one. Seeing our Golden Girls, the Matildas, live in action as they strive to qualify for the 2019 FIFA Women’s World Cup in France, as well as travelling one of the most fascinating tourist destinations in the world - how could you say no? After a heart-stopping 1-1 draw against Japan last night that had GGArmy fans inside Amman International Stadium of the edge of their seats, the Matilda’s have secured their place in the World Cup in France next year. But that is only part of the job done. Our girls are out to reclaim the Asian Cup, and the next hurdle is the semi-final against Thailand on Tuesday. Needless to say, we’re pumped! After a delicious local feast at Tawaheen Al Hana Restaurant (a must-visit for hummus fans) we transferred to Amman International Stadium to share in the Opening Ceremony and Opening Game of the Asian Cup with nearly 10,000 other fans – what an atmosphere! The Jordanian locals were strongly behind their female football team, and GGArmy did our best to cheer on the local side, but despite all the drumming and singing and flag waving from the crowd, they lost 2-1 in a thrilling second half come-back from the Philippines. As the jet lag began to wear off a bit on day 2 we took the opportunity to explore The Citadel and Roman Theatre in the morning before an 8pm kick off against Korea (we all know what happened there…). It’s difficult to comprehend just how old some of these structures are (dating from the Bronze Age! ), and the sweeping views over Amman from its hill-top location were breath-taking. Lana guided us through the history of the site, which really added to the whole experience. Well worth the visit! An overnight trip South of Amman to visit Madaba, Mount Nebo and the Dead Sea was next on Big Kev’s itinerary. There were many places of great Biblical significance in the area including the place Moses is said to have been shown the Promised Land, the area where John the Baptist preached, and where Jesus was baptised in the Jordan River. A therapeutic float in the Dead Sea, some mud facials and massage treatments were also on the menu for the GGArmy after a few hard days of cheering! There’s no better way to prepare for a Matilda’s match than a pre-match function with their own family and support team, and getting to know the parents of some of our favourite players has been an absolute highlight. We were lucky enough to have a few drinks with the Kerr, De Vanna, Van Egmond, Alleway, Polkinghorne and Kellond-Knight families before each game, and sit with them in the stadiums as we equally attempted to settle each other’s nerves and cheer our girls on! There were smiles all round after our 8-0 win over Vietnam, which looked great in the selfies we took with the players. We had plenty of chatter and got plenty of signatures while hanging over the fence with the girls after the games. As a World Heritage Listed site, you can’t go to Jordan without visiting Petra. Made famous by Indiana Jones, the façade of the Treasury building is just one of hundreds of tombs and temples that make up the city, which used to be a thriving metropolis for trade and travel in the region. GGArmy spent 2 days in Petra, but you could easily spend a week exploring all it’s trails and wandering through the ancient buildings chiselled from the sandstone mountains… Pack your hiking shoes, there are plenty of steps to climb! Or save your legs and take a donkey ride to the top. There aren’t many things that could top a trip to Petra, but being inside Amman International Stadium when Sam Kerr scored the equaliser against Japan to send us to the World Cup is one of them. After a week of nail-biting football action combined with guided exploration of one of the Middle East’s most spectacular countries, we’ve had an amazing trip so far. But with the Asian Cup finals still to come, as well as Big Kev’s tour itinerary, Jordan still has plenty in store for us over the next week! As I write this we are sitting on the bus, voices a little husky after screaming so much last night, travelling out to Wadi Rum to spend the night in a Bedouin camp in the desert. Be sure to keep an eye on our Facebook (@greenandgoldarmy), Instagram (@GGArmy) and Twitter (@GGArmy) pages to stay up to date with our adventures next week in Jordan! You couldn’t have written a more thrilling script to a semi-final. The Matildas, trailing Thailand 1-2, held on by a fingernail thanks to Alanna Kennedy’s equaliser in the 90th minute to send the game into extra time. Yellow cards, red cards, free kicks and shots on goal flowed in the additional thirty minutes that came, but to no avail for our girls, meaning the Matildas hopes of winning the Asian Cup would come down to a penalty shoot out. It took three stunning saves from Mackenzie Arnold and three amazing goals from Elise Kellond-Knight, Steph Catley and Sam Kerr to get us there, but the Matildas held their nerve to secure their place in the final on Friday night against Japan. The nerves of the GGArmy on the other hand were pretty shot after that! Wind back the clock a few days and we were happily enjoying ourselves with a few cold beverages and delicious felafel thanks to a special invitation to an “Arabian Nights” themed-party arranged by the social committee at the Australian Embassy in Jordan. Camel rides, palm reading, a DJ and a local Jordanian pop-star saw the GGArmy tear up the dance floor with 300 other guests. We even learned some Arabian dance moves! We felt very privileged to be invited, and want to say a special thank you to our friends at the embassy who have also come along to games to support our Matildas throughout the tournament. A must-see-experience for any traveller in Jordan is of course a desert safari in Wadi Rum to gain an insight into Bedouin culture. Piled into the back of a jeep we were guided through some of the most beautiful desert scenery you could imagine, including towering sandstone mountains, rust red sand dunes and hidden water springs. A traditional Bedouin feast was ready for us on arrival to camp after cooking underground on hot coals for 5 hours, and we were not disappointed – Big Kev made the big call declaring it his favourite meal of the trip! A cup of Bedouin whisky (sweet hot tea with herbs) while watching the sun set and the stars come out capped off an amazing day in the desert with our Bedouin guide Zedane. The opportunity to attend a Matildas training session the day before their semi-final match was a very special treat for the GGArmy. The girls looked sharp during their drills and small-sided possession games, and were very happy to take some time to chat to us afterwards – thanks for that ladies! As usual keep an eye on our Facebook (@greenandgoldarmy), Instagram (@GGArmy) and Twitter (@GGArmy) pages to follow along with our tour in Jordan. We’ve got four more days to enjoy some more of this beautiful country before flying home, hopefully bringing the Asian Cup with us! After an action packed travel itinerary throughout the group stages of the tour, we made the most of the opportunity to put our feet up and relax in Amman before the final. Soaking up the luxury of our hotel, The Boulevard Arjaan by Rotana, and the upmarket shopping district known as The Boulevard, the GGArmy treated ourselves to long, lazy buffet breakfasts in the sun, white fluffy robes in our apartment style rooms, and delicious dinners out in the top restaurants in the country. We were by no means doing it tough in the capital city! And what better way to see out the tour than with one final pre-match function with the Matildas family, friends, support team, sponsors and embassy representatives. We definitely went out with a bang, belting out all the Aussie anthems we could think of to get ourselves pumped for the game. Alas, the Matildas fell short of their one final goal of the tournament by just one goal on the field. While I’m sure they will be disappointed to have come so tantalisingly close to reclaiming their Asian Cup title from the Japanese, GGArmy fans are proud of how far they managed to progress in a tournament that did not see their best performances. The silver lining along with those silver medals is a chance for redemption in 14 months time at the FIFA Women’s World Cup in France. The count-down is on! Erin is on tour with the Green and Gold Army following the Matildas at the 2018 AFC Women's Asian Cup in Jordan. 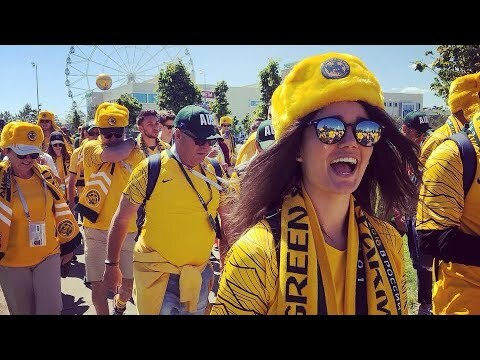 She is capturing all the action and fun on our social media channels including our pre-match event's with the player's families and of course all the Matildas matches and tourism highlights.